Women file fuses at Scarborough’s General Engineering Company plant, 1943. City of Toronto Archives, Series 1243. 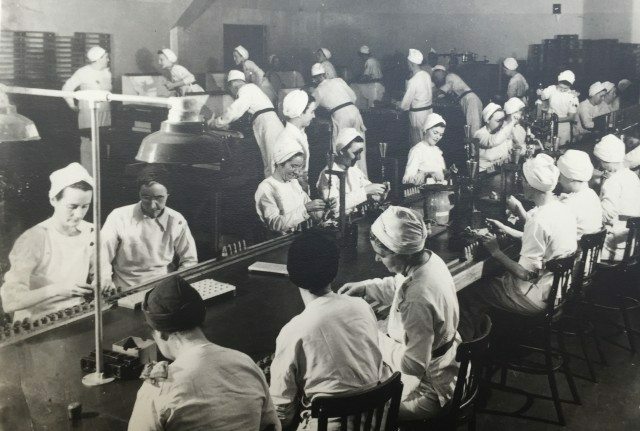 It’s highly unlikely that the 20,000 workers—predominantly women—of Scarborough’s General Engineering Company (GECo) munitions factory would have observed International Women’s Day each March between 1942 and 1945. The date wasn’t recognized outside communist countries until 1977. However, the employees may have appreciated its objective of recognizing the importance of women’s work in society: during the Second World War, these women filled more than 256 million munitions, making the GECo site Canada’s most industrious wartime parcel of land. As men increasingly enlisted to the armed services and the war industry grew simultaneously, women in Toronto found themselves called upon to fill the gap in production on the home front. Across Canada, the number of women involved in war production increased from 6,000 to 261,000 during the course of the war. Conceived by the federal government’s Allied War Supplies Corporation, the GECo munitions plant operated 24 hours a day, six days a week. The 346-acre campus, located between Warden Avenue and Sinnott Road south of Eglinton, was constructed between March and October 1941. Each day for the next three and a half years, workers reported to one of 172 buildings to perform tasks that were just as important and as risky as what took place on Europe’s battlefields; they regularly handled high explosives and volatile gunpowder. To fill one type of fuse, up to 76 different operations were required, and the plant was responsible for 41 types of fuses. Remarkably, in the plant’s three years of service, there was not a single recorded fatal accident. 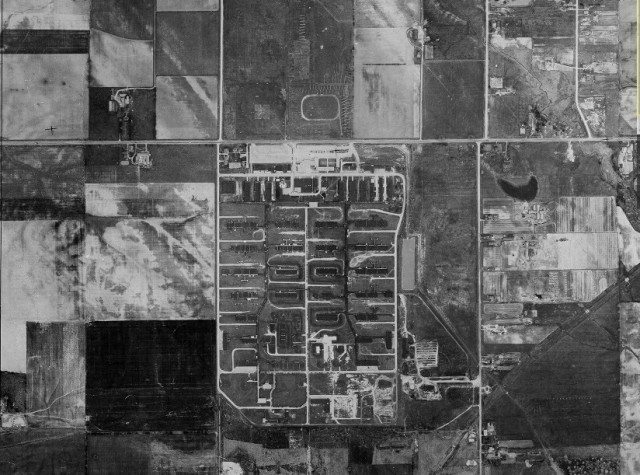 General Engineering Company site, 1947. City of Toronto Archives, Series 12, File 1947, Item 14H. “Idle hands help Hilter, but he isn’t getting any help from the workers of General Engineering,” said the narrator of a 1945 promotional radio program produced by GECo. 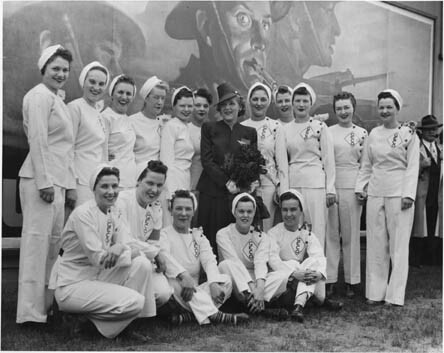 Dressed in crisp white uniforms, the women were lauded as “life-savers” by the Toronto Daily Star for their production of artillery fuses and shells. The paper reported that half of GECo’s employees had sons fighting on the front and many more had husbands, brothers, and friends serving in Europe. Working as a fuse-filler, Peggy MacKay wrote in an issue of the plant magazine, The Fusilier, that she came to GECo because she had too much time on her hands with her husband and son away. Different types of fuses filled at the General Engineering Company plant. City of Toronto Archives, Series 1423. Indeed, even Canada’s allies abroad were looking to GECo as a model of efficiency in the war industries. During a 1942 visit, a delegation from the Civilian Defence Volunteer Office in Greater New York said that they were “simply amazed at what Canadian women were doing.” Writing following his visit in 1943, Major General L.H. Campbell of the U.S. War Department wrote that he was “impressed with the rapidity with which the girls worked” and that “it was most unique and enjoyable to hear them sing during their work.” Known as “the fourth arm of the service” and “the women behind the man behind the gun,” the munitions workers were praised for their efforts in ending the war. The plant was such a point of pride that movie star Mary Pickford visited in 1943 and Princess Alice, wife of Canada’s governor general Alexander Cambridge, followed a year later. Actress Mary Pickford (centre) visits workers, 1943. Archives of Ontario, Fonds 2082. The necessity of the women’s work was reflected in their high wages and generous benefits: pay was set at a base rate of $19.60 per week (approximately $350 in today’s terms) with an annual cost-of-living bonus of 17 per cent. Employees were transported to their six daytime (or five nighttime) shifts each week by company shuttle buses that came from different locations in the city. The Munitions Workers Association, to which every employee belonged, acted like a union, bargaining for improvements to work conditions and bonuses. Among the benefits provided to GECo employees was a non-profit cafeteria that operated with the objective of providing “nutritious, healthy meals” for employees. GECo also operated a nursery for the children of its workers. This mark of a progressive workplace was all the more remarkable for its low cost: workers paid 35 cents per day for one child and 50 cents per day for two, compared with one dollar per day at other area nurseries. The Fusilier newsletters regale its readers with stories of the children’s activities. 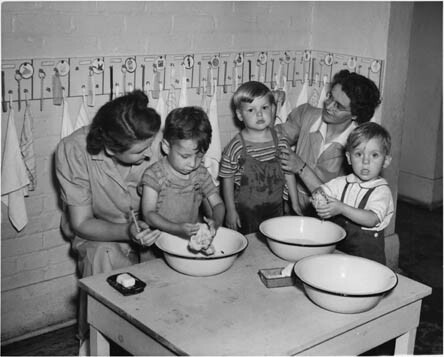 Children wash up for a meal at the General Engingeering Company daycare, 1943. Archives of Ontario, Fonds 2082. GECo workers were diverse in their experiences and backgrounds. Among them was Dorcas Trotter, a war refugee and surviving passenger on the SS Athenia, which was torpedoed by a German submarine in 1939. Many other workers came to Canada before the war or during its early years and still had family living in war-torn nations: Greeks, Venezuelans, Russians, Chinese, Poles, Syrians, and Nigerians all worked at the plant. The December 1943 edition of The Fusilier described the experience of Christmas in both their homelands and new home, the latter of which was often absent of extended family who were still overseas. Separated from their families, the employees of GECo found a sense of community among one another. Like many of Toronto’s 20th-century manufacturers, GECo was a place of both work and play: golf driving practice, shuffleboard, badminton, volleyball, softball, and bowling were all offered to employees on and off the campus as a way of inspiring solidarity and maintaining good spirits in the workplace. More than 200 GECo employees entered the company’s 1943 fall fair, exhibiting vintage stamps, crocheted jewellery, and knitted scarves. Winners of General Engineering Company’s Miss War Worker contest, 1943. City of Toronto Archives, Series 1243. The women who worked at GECo were also encouraged to participate in the annual Miss War Worker pageant, a “beauty pin-up contest,” held by several manufacturers. Winners from the company event would go on to a city-wide competition, which included representation from John Inglis and Company, Massey-Harris, and Toronto Shipbuilding Yard, and which was part of the Miss Toronto pageant. The 1943 GECo contest saw 56 women, clad in their work uniforms, compete at the company level; judges deliberated their decision for three hours before crowning Alice Newman of the high explosives division the first-place winner. Neither Alice nor her fellow GECo bombshell beauties took home the $300 first prize at the city competition, which went to Dorothy Dales, an assembly line inspector at Research Enterprises in Leaside. The Munitions Workers Association oversaw not only company bargaining and social activities, but also invaluable war drives within the company. During the six months following the plant’s opening, the association had involved 2,000 workers in blood donation drives for the Red Cross. In the same period, the employees had also subscribed over $250,000 to the Victory Loan campaign through fundraising events that included vocalist Barry Wood of NBC’s Your Hit Parade. Industrious and generous in both material and spirit, GECo and its workers were representative of Toronto—and Canada’s—contribution to the war. 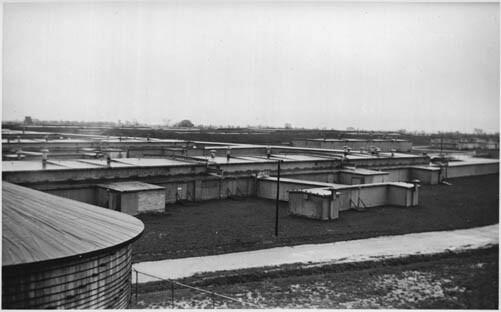 View of General Engineering Company buildings, 1943. Archives of Ontario, Fonds 2082. Following the war, the Canadian government decided not to raze the 172 buildings, but instead turned a number of them over to the City as postwar emergency housing. The GECo housing community had between 2,000 and 6,000 residents between 1946 and 1954. At the same time, the municipality was acquiring the surrounding property for development into what would become Canada’s famous Golden Mile of Industry. Some of the original low-rise buildings remain to the southeast of Warden and Eglinton, a physical reminder of the vital work that Toronto women performed during the Second World War. Additional material from The Globe and Mail (November 24, 1942; May 6, 1947; October 30, 1948; January 28, 1948; February 25, 1942), Toronto Star (June 7, 1941; May 23, 1942; July 14, 1942; August 25, 1942; June 30, 1943; November 10, 1943), City of Toronto Archives, Series 1243; and Archives of Ontario, Fonds 2082.